The peak wavelength is stable within a 7 nm range. The average light intensity seems to change a bit while the lamp gets warmer but then stays pretty much the same. The reds and the greens (yes there were greens!) peaked at the same wavelengths. The red intensity goes down while the lamp heats up but after a while it stabilizes. The values in the CSV file are not in %! So far it looks good for reproducibility of data, although one should repeat the test on another day with absolutely identical setup to be sure. Even better if different guys in different places with different spectrometers got the same results while sharing only the same ONE lamp for their experiments. The next reproducibility test I will perform with a CFL lamp because there are thinner lines to detect. Were you able to assess intensity stability over time? See @stoft's post for his approach to measuring intensity stability. But I must admit that I was more looking for the peak wavelengths than for the intensities because the places of the peaks usually are the fingerprints (for material spectra) not the heights. I will have another look at stofts statistics to see if I can evaluate my data more in-depth. And now that the time-lapse capture macro is working I might do some more tests. What I would like to find out one of these days is, how often we have to re-calibrate the spectrometer - every week? Once a month? Only once? The longterm drift in wavelengths over weeks or months would be interesting. But that would mean to set up the thing and leave it untouched for the whole test period. Absolutely stable environment conditions (no displacement of the apparatus, regular light source pre-heating, light ray angle stability, stray light prevention, vibration prevention, temperature stability and so on...) over weeks to capture maybe one spectrum a week or so. 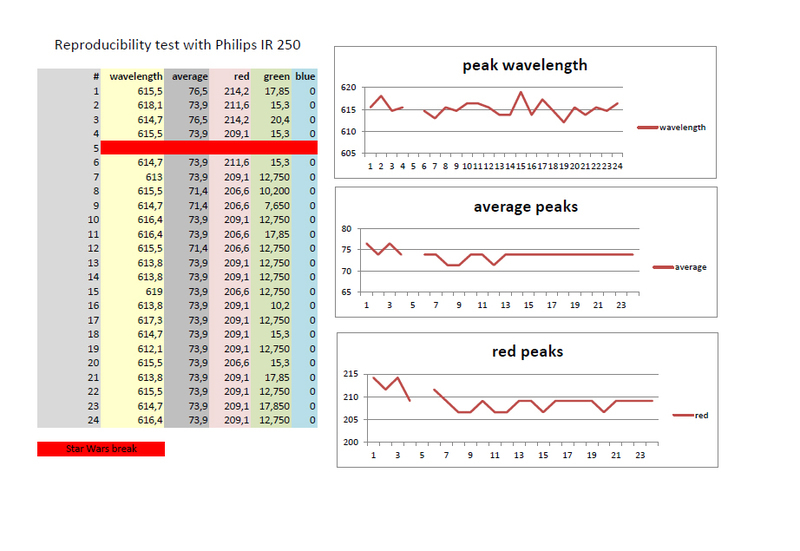 Then calibrate all the spectra with only one calibration spectrum and look at the differences. I guess it could be interesting for the oil testers here, too. And of course, it would be great if anyone who can get hold of a Solux could re-do stoft's tests and statistics to see if the results are the same in Australia or the Phillipines. Because thats exactly what would make a oil pollution database workable: different spectrometers producing the same "fingerprint evidence". Perhaps you could even exchange or pass around some oil samples to as many spectrographers here in the forum as possible and compare the results. Great questions. I do think @stoft is mostly interested in intensity stability for the moment but both are good questions. I'm interested in whether the stability of the solux is unique or if all incandescent bulbs are that stable. Or if the 12v power source @stoft is using is relevant. The last point would be easiest to test: test a no-brand lamp with the same setup and the same power source and do the same stats on the results.